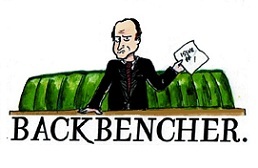 The Backbencher – No Tory Win Under Cameron In 2015? No Tory Win Under Cameron In 2015? Conventional wisdom argues that the fiscal aftermath of the financial crisis has changed the former consensus that UK politics had become, at least in economics, a largely ideology-free zone. Despite Labour’s occasional grudging acceptance that the scale of deficit and debt need to be reduced, Cameron and Miliband, says received opinion, will in 2015 present the British electorate with a starker choice between two competing visions of UK political economy than at any time since 1979. But will they? On present form, the uncomfortable reality that will face voters in 2015 is that there is very little difference between the Cameroon Tories & Ed Miliband’s Labour Party: far, far less, in fact, than both like to pretend. Both are committed to a centralised, bureaucratic, relatively authoritarian state: to an economy where at least 40% of GDP is accounted for by state spending: to deficit and spending reduction programmes whose differences are so minimal as to be within the rounding errors and actually increase public debt: to membership of the EU in some form or other and acceptance of many its damaging costs on an increasingly flimsy assumption of the supposed benefits: and to slavish obeisance to flawed Green energy policies which threaten energy sufficiency while hiking its costs. The only real argument and difference between them here is about whom their commonly-accepted, homogenous state should be run by. That does not seem very much like the starker choice predicted by so many. Even three years out, though, there are indications that framing the election question more explicitly highlighting the ideological alternatives might pay electoral dividends. Gove’s school reforms are popular with parents: the public tell pollsters that spending cuts, not tax rises, are their preferred method of addressing the debt and deficit: opinion polls record broad approval towards curbing welfare benefits: and the Conservatives experience a ratings bounce when adopting a more EU-sceptic tone. So how suited to an electoral strategy of emphasising ideological difference with Labour, rather than acknowledging a pragmatic similarity, would be Cameron’s leadership? What would be the implications for Cameron’s victory potential? The runes are not good. It may be tempting to interpret Cameron’s Tory Party conference speech last week as a forceful re-adoption of the more robust and less state-centric Conservatism to which he professed allegiance to secure the leadership of his party in 2005. But observers need to remember that he has previous form in reverting to a robustness calculated principally to reassure, and then only when metaphorically with his back to the wall – and that the words tend not to be followed by action. Few could disagree with the beliefs and policy wishes articulated in his conference speech. But therein lies their weakness for a more robust, differences-emphasising approach to the 2015 General Election, because they were also anodyne to the extent of being an indictment of the poverty of a limited ambition. Where was the implacable intention to enable people to keep more of their own money and hand less to the public purse? Where was the steely resolve to give people more control over their own lives? Where was the determined commitment to remove in a major way the dead hand of the state from people’s choices of medical care, education, retirement provision & much else besides? They were absent. Peter Snowdon’s “Back From The Brink – The Inside Story Of The Tory Resurrection” and Francis Elliott & James Hanning’s “Cameron: Practically A Conservative” provide a portrait of a present leader without over-arching or even significant ideological conviction about where he would like to take the country and without a vision of the shape he would like to leave it in. It’s sometimes recounted, possibly too often to be purely apocryphal, that Cameron’s reply to the question “Why do you want to be Prime Minister?” was merely “Because I think I’d be rather good at it”. Reading Snowdon and Elliot & Hanning, it becomes worryingly easy to imagine an alternative answer of “Because it’s the sort of thing that chaps like me are expected to do”. The temptation is to conclude that office is the end, the achievement, rather than the precondition, the starting-point, for achievement. Cameron, therefore, is a relaxed pragmatist, not a conviction politician. That, admittedly, is hardly a revelation, but in a 2015 election where the voters might, for the first time in 36 years, be receptive to a message of ideological conviction rather than a promise of pragmatic managerialism, it could be the factor which snatches defeat from the jaws of victory.